Only two species, one in North America, the other in northeastern Asia. P. dubium Maxim. 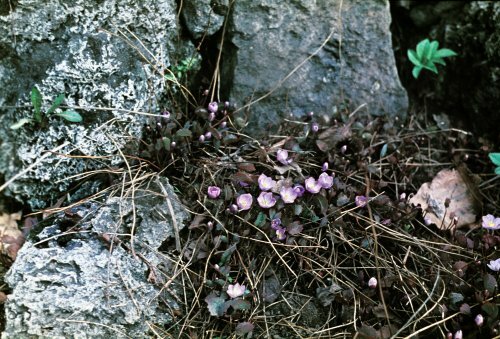 [Jeffersonia dubia (Maxim.) Benth. et Hook.]. Far East (Primorskiy Region, Amur River basin) and northeastern China. Deciduous broadleaved forests, on humus-rich soil, in shade. Plant with rhizome. Flowering stem 8-10 cm, elongating after flowering to 20-30 cm. Leaves long-petiolate, with almost circular blade, dark red during flowering period, later green. Flowers solitary, 3-5 cm in diam., pale lilac. V - early spring to beginning of autumn. Fl - April-May for two weeks. Fr - June-July. P - by division and seed. Flowering the third year after sowing. Recommended for group planting on well-drained soil, and for the rock garden. Can grow in full sun and in semishade. Z 4.